Are you craving FRESH ORGANIC Produce? Click truck for more info. 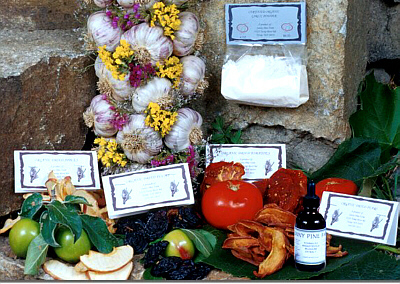 Ed and Vicky Welch are committed to providing their customers with only the finest organically grown products. As an early participant in the Washington State Department of Agriculture's Organic Certification Program, Sunny Pine Farm in the Twisp River Valley strives to provide the highest quality produce and prepared products. 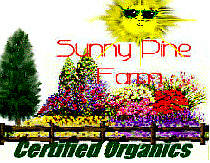 Sunny Pine offers dried fruits like- tomatoes, apples, & pears. All fruits are certified organic and pesticide-free, packaged in sealed food grade gussetted poly bags for extended shelf life, with a card stock label. Perfect for snacking and backpacking, as well as in cooking. Organically grown Spanish Roja garlic is A Sunny Pine's specialty. Sold in a convenient powde form, easy to use when your time is limited... or sold fresh in bulbs by the pound. During all seasons there are 14 varieties of delicious potatoes, onions and winter squash available for your enjoyment. We make our products when nature supplies the materials. All orders are filled from inventory, generally within 2 working days. Shipping &. Handling: UPS, Federal Express, USPS. Payment Requirements: Cash, Check, Money order After first order, we will accept net 30 days. Quality Assurance: Products are continuously tested. Our alcohol, used in the extracts, is tested for purity. beneficial microbes from compost tea periodically. If at any time you feel your product is not of the highest quality, return the unused portion for a full refund upon inspection. See our complete product list below. This product is Echinecea Angustifolia which has a very potent medicinal purpose. We grow our own in our certified organic field as well as produce our own alcohol for the extraction process through our sister company Sunny Pine Distillery. We chose to grow this particular species as it is a non-specific enhancer of immune function. It also has a long history of use (both internally and externally) against the bites of venomous insects and snakes, and helps alleviate the swelling and pain of bee sting. Previous years we have used the blossom to produce the extract and this year we will be using the root. The root takes three years to develop properly and this will be out first root crop year. We have planted yearly crops to ensure a harvest each year. cycle for women as well as calming to the nerves. This is the most important Native American Pacific Northwest anti viral herb. Works where other anti-virals fall short. We wild craft for this and take care as to not harm the future production of it. Target buyers for these product are companies that sell natural healing products. These products can also be sold to companies interested in purchasing bulk unlabeled product or we can put their label on it. Materials and equipment used in producing this product include farm equipment, bottling equipment, and a distillery. All of which we currently own and operate. We order bulk bottles wholesale as well as labels. There are currently five people involved in the process of making the extracts as well as contracted farm labor for field upkeep. This is lavender water packaged in a Cobalt Blue glass container with a fine mist sprayer and cap. It can be used as a facial astringent to tighten the pores, pain reliever for sunburns or an after shower refreshment enhancer. This is a pouch made of lavender blossoms and flax seed sewn into a muslin cloth with a separate outer lining made of silk. This is great for relaxing any tension and for headaches, or for an overall feeling of calm. The outer lining comes in a variety of colors. This is a lavender filled muslin bag with a long tie string that can be hung onto the bath faucet. This is a bath time delight to relax muscles and bring about a feeling of peace. This is a product made from our own Lavender, Comfrey, and Yarrow and local beeswax. It it great for skin burns and extremely dry skin. It comes in a 1 oz container. food grade gussetted poly bags and sealed for shelf life. We have two kinds to choose from. is a very distinct gift. $5.00 per 4 oz jar. Minimum of 12 jars ordered. We are furthering development of this product into different flavorings. This is one that we will be able to utilize the Certified Community Kitchen in order to process. Quantity on this product will be somewhat limited as it is seasonal, however, this year we plan on making at least 100 cases of 12 jars per case.